Beautiful and romantic rose gold gives these 14K rose gold love knot earrings from Apples of Gold Jewelry a sweet appearance. 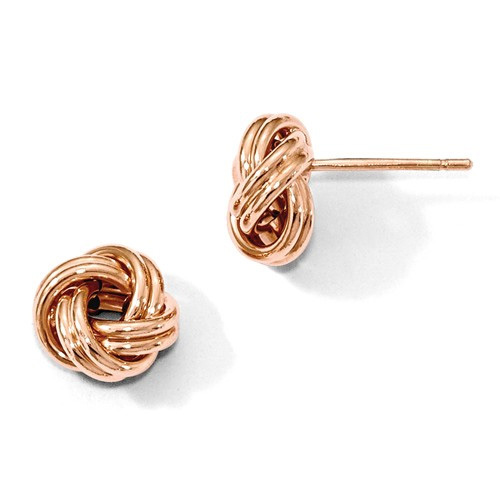 The soft pink hue of the rose gold stands out in these simple, yet elegant, love knot design earrings. With a twisting appearance, these love knots go over and under to create a favorite! The earrings measure 9mm by 9.75mm each in size, making them ideal for wearing on a daily basis or saving for a special occasion. The post that attaches to the love knots are also made from 14K rose gold. We guarantee our 14K Rose Gold Love Knot Earrings to be high quality, authentic jewelry, as described above.